Please note that the content of this book primarily consists of articles available from Wikipedia or other free sources online. 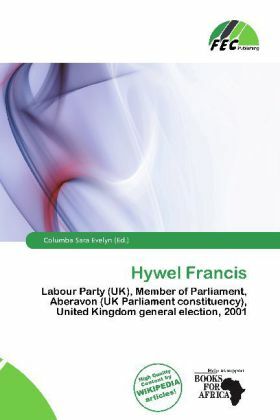 Dr (David) Hywel Francis (born 6 June 1946) is a Welsh Labour Party politician, who has been the Member of Parliament (MP) for Aberavon since 2001. Hywel Francis attended Whitchurch Grammar School and Llangtwg Secondary School. He studied at the University of Wales, Swansea, where he earned a doctorate in history. Francis continued to work at the University of Wales as a Professor in Adult Continuing Education prior to being elected in 2001.